Search best airfare deals to Tamarindo from your city. As your arrival airport, choose Liberia international airport, which is roughly an hour drive from Tamarindo along route 21 through Palmira, Filadelfia, and Belen. Alternatively, you may keep Juan Santamaría International Airport (SJO) as your arrival airport. However, you will need to spend around four hours to reach your destination. Tamarindo is famous for eco-tourism.Resting on the Nicoya Peninsula on the Northern Pacific coast of Costa Rica, Tamarindo is the largest developed beach town in Guanacaste and the second-largest in all of Costa Rica. What is the Best Time to Visit Tamarindo? 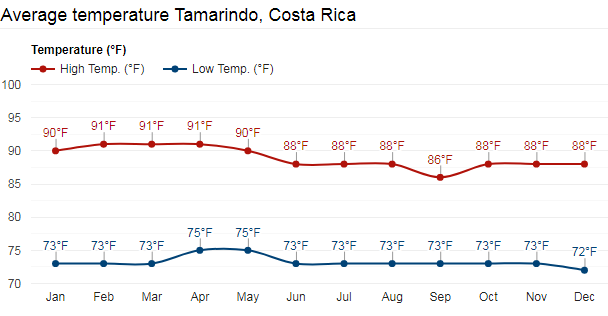 Mid-November through August is one of the best times to visit Tamarindo. The season receives little or no rainfall. The upper limit of the temperature stays between the highs of the 80s and lows of 90s. However, the lower limit floats in the lows of 70s. This National park in Costa Rica, situated north of Tamarindo, is spread over approximately 43.243 acres (175 km²) marine. More than half of the park is covered by four beaches (Carbón, Ventanas, Grande, and Langosta). Walking on the swash area covered with white-sand beaches with winds caressing your cheek is an unforgettable experience. The park witnesses the estuary of Matapalo River which is overwhelmed with mangroves. A national park is a sacred place for environmentalists and students who spend time camping to watch and study about birds, leatherback sea turtles, and other animal species. A 34-minute drive from Tamarindo takes you to one of the most beautiful beaches of Costa Rica. From Playa Dominical the distance is a bit shorter – only 20 minutes’ drive is sufficient. The place derives its name from two windows like holes (Ventanas) present in the cliff facing the beach. Simply bring a towel, a snack and enjoy swimming and other water sports on the sand and beach water. The beach is home to a variety of wild but not dangerous species including monkeys, numerous birds, toucans, and macaws. This is a fantastic camping place, though a bit pricey. Come anytime, set up your camp near the beach face or berm area and enjoy your day swimming, snorkeling, fishing, scuba diving, and other activities. The palace remains crowded in the dry season. If you are looking for a beach fun with lesser tourists, head to Quepos. This is a signature drink of Tamarindo. You are likely to find it across all bars and restaurants. Tamarindo has a vibrant nightlife. Come evening or late night; you will find bars, clubs, and lounges packed up to their capacity. A few bars have karaoke, big screen TVs and games like ping pong and pool. Women have a choice to go with ladies night. , and nearly every bar in Tamarindo hosts a ladies night. Want to try your luck? There are small casinos with roulette, blackjack, and slot machines. Some bars run poker nights too. If you are traveling from the US or other international locations, fly into Liberia International Airport. A one-and-and-a-half hour drive makes you reach Tamarindo. You may hire a private transfer or a shared shuttle. Alternatively, you may choose Juan Santamaría International Airport (SJO) as your arrival airport. Most of the flights from the US cities are connecting ones with Mexico City – MEX as their stopover airport. Top passenger carriers available on the routes are Copa Airlines, Interjet, American Airlines, Aeromexico, etc. How Much Does a Flight to Tamarindo Cost? On the top of the page we have displayed some best Tamarindo airfare deals. However, the fares in the aviation industry are dynamic. The price of plane tickets to Tamarindo is subject to change and non-warranted. Check current cheap air tickets to Tamarindo with our flight booking engine. Why Book Airline Tickets to Tamarindo with Cheapfaremart? Search, compare and book your cheap air tickets to Tamarindo. For help regarding finding the best flight routes and reserve your flight, call us on 1-844-869-5222 (Toll-Free).